Anthony Burgess often collaborated with visual artists such as Joe Tilson (on Will and Testament) and Fulvio Testa (who illustrated A Long Trip to Teatime and The Land Where the Ice Cream Grows). 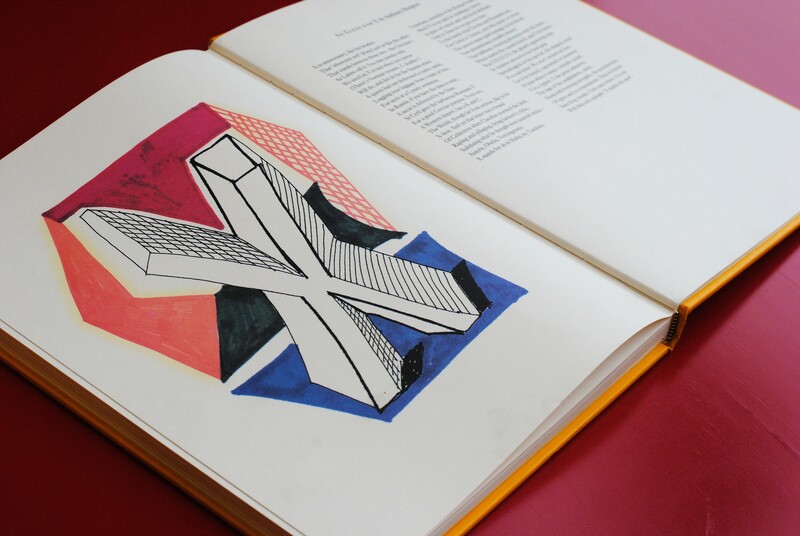 Another collaboration took place in 1991, when he was invited by Stephen Spender and David Hockney to contribute to the book Hockney’s Alphabet. 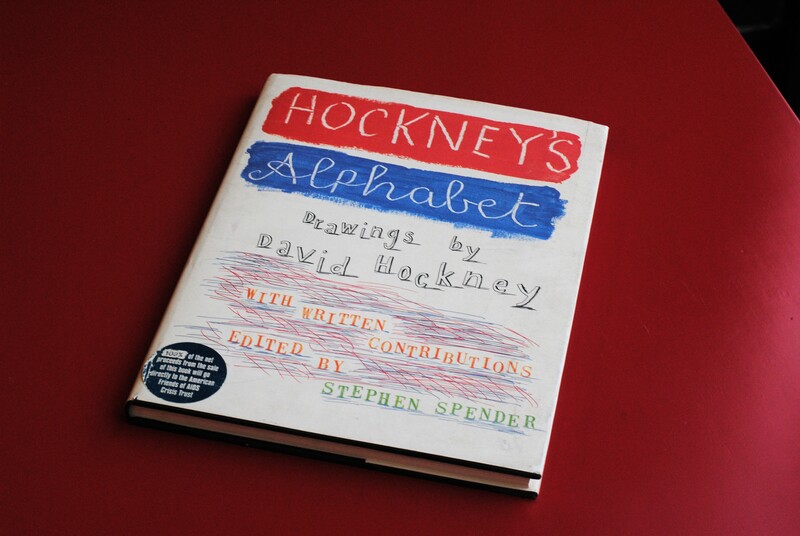 The book pairs Hockney’s artworks, each representing a letter of the alphabet, with a piece of writing by notable authors from the UK and the United States. The project was conceived to raise money for the AIDS Crisis Trust, and includes works by such authors as Iris Murdoch, Gore Vidal, Margaret Drabble, William Boyd and Erica Jong. The list contains five Nobel Laureates in Doris Lessing, T.S. Eliot, Seamus Heaney, William Golding, and Kazuo Ishiguro. The works are a combination of essays, poems, and prose, with an amusing exception being the inclusion of Norman Mailer’s letter refusing to be involved with the project. The edition of the book which is preserved in the library at the Burgess Foundation is not the regular version that was sent out to shops. 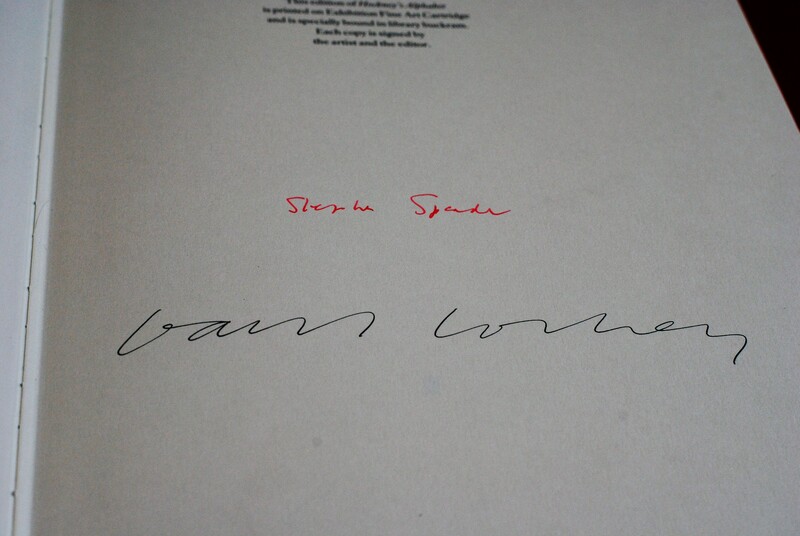 Burgess’s contributor’s copy is signed by both David Hockney and Stephen Spender, and is specially bound in library buckram. At least when it essays a double sound. 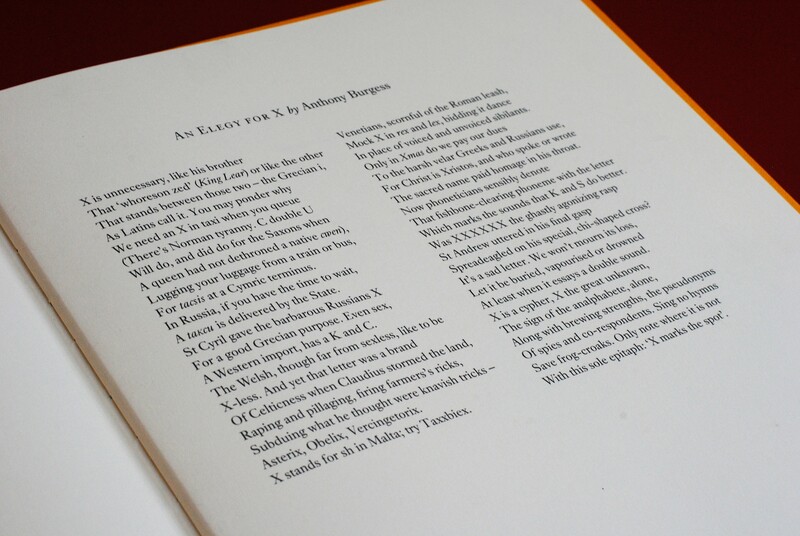 While this book reveals a charitable side to Burgess (he donated his poem without fee), it also shows how he was viewed by his peers towards the end of his life. The list of authors included in this book helps create a canon in which Burgess was included. Burgess also corresponded with, and wrote about, many of the authors included in the list. 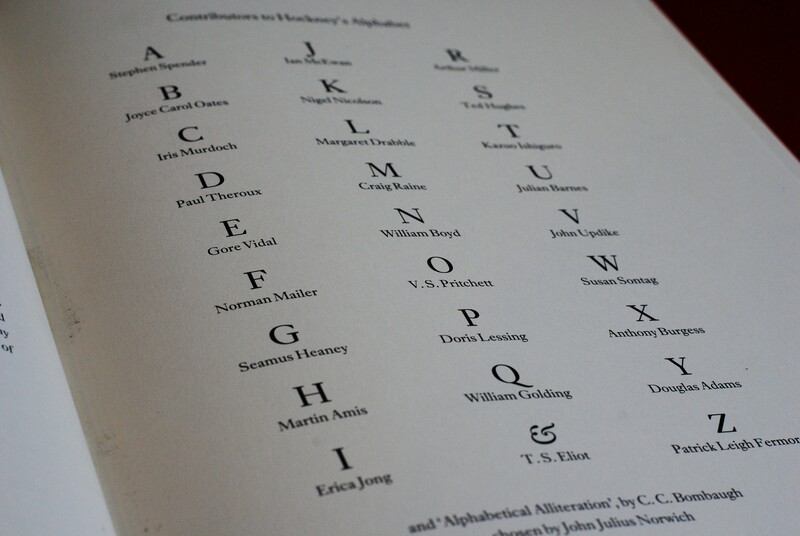 Eight of the authors included in Hockney’s Alphabet are featured in Burgess’s survey of twentieth century literature in English, Ninety-Nine Novels (1984). These are Norman Mailer, Doris Lessing, William Golding, Iris Murdoch, John Updike, Gore Vidal, Paul Theroux and Erica Jong. Burgess was also friends with some of the authors, including Vidal, Jong, and Golding, for whom Burgess wrote an affectionate obituary in 1993, stating ‘He wrote beautifully, but he did not write enough’. Hockney’s Alphabet is just one example of Burgess’s preoccupation with collaborative writing, and throughout his career he worked with other writers, artists, musicians, and composers to create new pieces of work. He collaborated with the photographer David Robinson to write his 1976 novel Beard’s Roman Women; with composer Stanley Silverman on Oedipus the King and the Midsummer Night’s Dream Show; with Michael J Lewis on his Grammy nominated musical Cyrano; and he contributed introductions to books on subjects as varied as Shakespeare, food in the works of James Joyce, and paparazzi photography. These collaborations show that Burgess’s engagement with the work of his contemporaries went beyond reviewing, and that he was an active participant in the cultural landscape of the late twentieth century.